Match your dog’s sassy personality with the cool style of the Sassy Dog Wear Reflective Skull Dog Collar. Because every dog deserves an accessory that’s just as cute as they are, this collar is decked out with a bad-to-the-chewbone pattern that puts a doggy punk twist on the classic collar. The high-quality design is made from sturdy nylon webbing that is both soft and durable, with a quick-release buckle that allows him to get “dressed” in seconds. Plus, the skulls are not only stylish, but are also reflective so they bounce back light to make your nightime walks safer. And because quality matters, it’s sewn by hand right here in the USA. 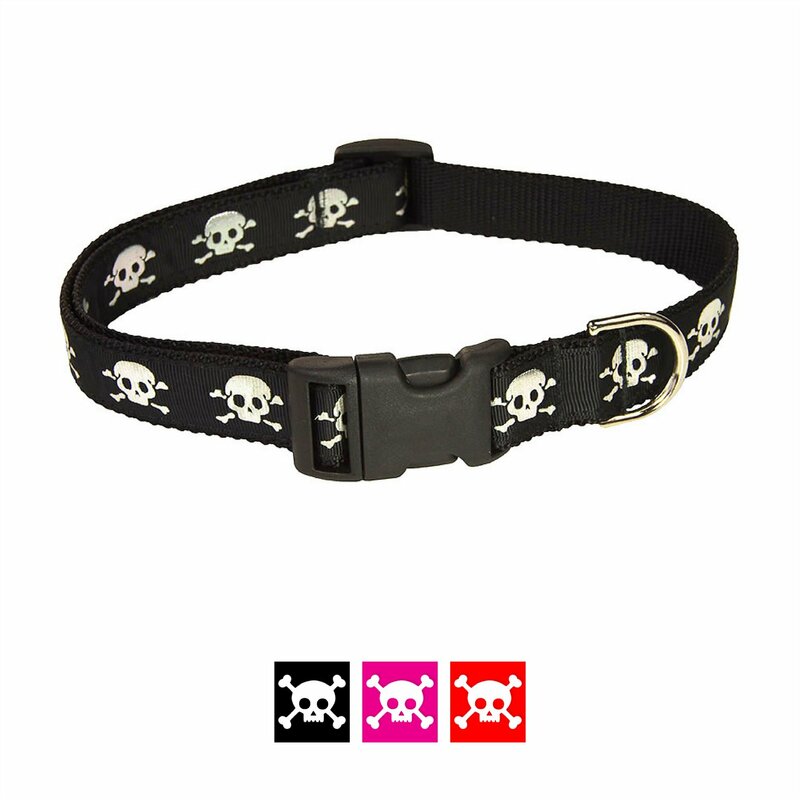 Get the matching Sassy Dog Wear Reflective Skull Dog Leash and Harness to match! Adorable skull and crossbones collar adds some sassy style to your dog’s everyday look. Made with sturdy, nylon webbing that is durable while feeling soft against his skin, and is adjustable for a comfy fit. Quick-release buckles allow for easy on and off, while the D-ring allows for secure leash attachment. The skulls are made of a reflective material that increase visibility during nightly walks. Handmade in the USA by a family-owned business, with a matching harness and leash available; comes in a variety of sizes for the perfect fit. Click here for matching Sassy Dog Wear Reflective Skull Dog Leash. The reflective skulls are peeling off. The skulls were one of the reasons I picked this collar and day one they started peeling off. Not happy with this product at all. We love this collar and it's reflective ability. It fits true to size and is easy to put on/remove. Our only complaint is that the skulls have all but worn off already and we've only had it since July. Thankfully I got this collar on sale or I would have been really mad. The "reflective" aspect of this collar is silver foil printed skulls. The skulls started rubbing off after a few days. Other than that it is a very nice collar. I bought 3 of these in the variety of colors. After the first washing, the reflective skulls washed COMPLETELY off of the black collar. So I purchased a second black collar thinking it was just the coloring or something else like that. Well I washed the other 2 colors and now it's happening to them. It's too bad since they are cute collars. Looks super on my frenchie with big orange flower added. Silver skulls look cool but may fade or rub off over time. after a few months the reflective skull wore off. why pay extra for something that will be a black collar in a few months??? Loved the appearance of the color, but a couple of rolls in the dirt and the skulls are rubbing off. Not even a week of wear and its missing half the skulls.